Many post offices in southeast South Dakota and northeast Nebraska are slated to have reduced hours of retail service. Approval of the Post Office Structure Plan (POStPlan) by the Postal Regulatory Commission last week cleared the way for this process to begin. It doesn’t seem to be making much news right now, but I’m guessing that will change in the coming weeks as post offices get notifications of the plan and community meetings are scheduled. More than 13,000 rural post offices across the nation will have their retail window hours reduced to six, four or two hours each weekday. Retail window service hours are proposed to be reduced to six hours in the following area communities: Avon, Centerville, Menno, Springfield and Viborg. In Nebraska, Verdigre and Wausa will go to six hours. Post offices slated to go to four hours are: Bridgewater, Gayville, Irene, Lesterville, Mission Hill, Tabor and Wakonda. In Nebraska, Center, Fordyce, Newcastle and Wynot will go to four hours. Post offices scheduled to go to two hours are: Utica and Volin. In Nebraska, Magnet and St. Helena will go to two hours. Elk Point, Freeman, Lake Andes, Vermillion, Wagner and Yankton will maintain eight hours of service, as will Bloomfield, Creighton, Crofton, Hartington, Laurel, Niobrara, Osmond, Plainview, Ponca and Randolph in Nebraska. A story with more information will appear in Wednesday’s edition of the Press & Dakotan. “Save The Post Office” covers this issue in depth. Where have all the good jobs (i.e. good salaries) gone? Well, increasingly, they don’t exist. In 1988, President Ronald Reagan delivered a State of the Union address in which he declared that the war on poverty had failed. Now, with the poverty rate in America expected to reach its highest rate since 1965, it looks like Reagan may have been right. Not so, says Peter Edelman, a professor at Georgetown University and an expert on poverty, but, he tells Raz, there is a lot to worry about. One half of all jobs in the U.S. today now pay less than $35,000 a year. Adjusted for inflation, that’s one of the lowest rates for American workers in five decades. There’s a common perception that somebody who’s poor or living below the poverty level is lazy or simply living off government handouts. Edelman says the actual average poor person is working. You read that right: One half of jobs in America now pay less than $35,000 annually. In Yankton County, for example, the number of people above the age of 25 with college degrees rose from 10.3 percent in 1970 to 26.8 percent in 2010, according to Census data. That was slightly below the 2010 national average of 27.9 percent, but higher than the South Dakota average of 25.3 percent. Yankton County had 10,273 adults over 25 years of age in 1970 and 15,390 such adults in 2010. A study by the Center for Economic Policy and Research, “Where Have All The Good Jobs Gone?,” finds that the nation, in general, has increased its education levels, but that has not led to better jobs. 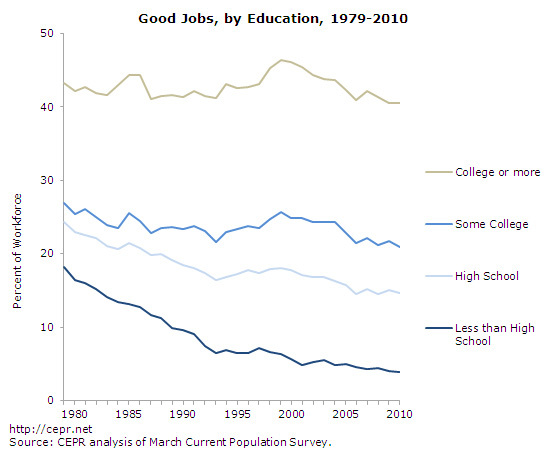 The U.S. workforce is substantially older and better educated than it was at the end of the 1970s. workers had a four-year college degree or more, up from just one-fifth in 1979.
good job by our definition. Let’s look at some of the jobs in Yankton County and see how we stack up. A recent flier from Yankton Area Progressive Growth showed that the average annual wage for a Yankton County manufacturing worker was $37,124 — just barely fitting into CEPR’s “good job” category by that measure. For someone in professional services, the average wage is $29,296. If you are in business support services, it’s $27,768. Unknown is how many of those jobs have health care and a retirement plan. According to the Bureau of Labor Statistics, Yankton County workers had an average weekly wage of $641 in the second quarter of 2011 (the most recent I could find). That’s $33,332 per year. When all 66 counties in South Dakota were considered, none had wages above the national average of $891. Ten reported average weekly wages under $500, 23 had wages from $500 to $549, 12 reported wages from $550 to $599, 11 had wages from $600 to $649, and 10 had wages of $650 or more. So what does CEPR think is happening with the economy? United States in direct competition with typically much lower-wage workers in the rest of the world. explanations for the decline in the economy’s ability to generate good jobs. Ultimately, these are some sad facts to chew on, I think most anybody would agree. But those are the facts. The question is, what do we do about them? It’s easy to get caught up in your own life and perspective on things. That’s one reason I’m such an avid consumer of news, books, films and music — because they are able to give me a wider perspective on things and prevent me from getting so caught up in myself. This also helps develop a very important muscle called empathy. Too many people don’t exercise it enough. I know I have my own work to do in this area. I’ve been consuming a plethora of information about poverty lately — a lot of it by accident. It’s a subject that has really been occupying my thoughts more than usual and prompted me to write a column recently. If you can handle a punch to the stomach, watch it and see if it doesn’t put some things in perspective for you. Homeless children are the casualties of Romania’s recent history. In an effort to increase the nation’s work force, former communist leader Nicolae Ceauşescu outlawed contraception and abortion in 1966. Thousands of unwanted children were placed in state orphanages, where they faced terrible conditions. With the fall of Communism, many children moved onto the streets. Some were from the orphanages. Others were runways from impoverished families. Today there are 20,000 children living on the streets. The resources for sheltering these homeless youths are severely limited. When some individuals advocate making abortions illegal and contraceptives more difficult to access, “Children Underground” demonstrates the potential outcomes of those policies. Granted, the circumstances in Romania are/were much different than the United States. But it’s something to think about, all the same. I also ran across a great column in The Guardian about poverty written by Jonathan Glennie. Speaking at a business meeting recently, I was reminded of a deep-seated instinct common among the elite, political and educated classes that continues to prevent many countries from addressing historic inequalities and progressing on poverty reduction: that it is the poor’s own fault that they are poor. I have lost count of the number of well-educated, well-off people I have spoken to who seem to believe that poor people somehow “want to be poor” or are simply too dim to escape from poverty. The banana-businesswoman’s view that “poor people suffer from a culture of poverty”. The ex-beauty queen who told me that she had once begged at a traffic light as part of her studies and had come to the conclusion that it was an easy way to make money – poor people must just be lazy, she said. The USAid consultant who explained to me over lunch that “some indigenous people just don’t want to develop”. It is not only failed economic and social policies that are barriers to poverty reduction; it is this failure of so many people – voters, politicians and so-called “development experts” – to empathise with the reality of poverty and the problems poor people have to overcome. How often do you find yourself thinking the same things Glennie laments hearing? How often do you hear other people say these things? It’s very easy to project things onto people we don’t know, especially when they lead very different lives from us. At a time when debates are being had about the poor (very much in the vein of “Are they poor because they are lazy and/or want to be poor?) in our own country and cutting more services available to them, it is important to dig into these subjects and better understand the circumstances these people face and figure out what we can do as a society to bring people out of or avoid poverty. OK, this has been kind of a downer post, so perhaps I should end it on a musical note. It’s very much related to the subject at hand but also happens to be one of the best Britpop anthems of the 1990s. Does Yankton Need An Events Coordinator Or A Retail Development Position? Or Both??? The Yankton City Commission had a really fascinating budget discussion Monday night about holding more events in the city to improve the quality of life and becoming more aggressive with retail development. In speaking with residents here, I know both are very important issues with them. The story below ran in the Press & Dakotan today, but I had to make quite a few cuts to it for the printed version. Here I am able to run the uncut version, so to speak. It has more details of the discussion. Again, given how important these issues are, I thought some of my readers may appreciate the additional information. The Yankton City Commission was in agreement during a budget session this week that it wants to support more events that improve the quality of life in the community and get more aggressive about promoting retail development. However, the question came down to how best to accomplish those goals given limited budgetary resources. During an hour-long discussion Monday, the commission debated the merits of creating an events coordinator position, a retail development position and other possible solutions. Parks and Recreation Director Todd Larson said he had been looking at a concept of the city holding a significant event approximately every month with an event coordinator responsible for organizing them. • a Cinco de Mayo event in May. For the larger events, Larson said some of the costs could be recouped by bidding out sponsorships. Questions arise if the city began to assist nonprofits with their events, Larson admitted. How revenues would be shared or shortfalls filled are examples, he said. Commissioners said the idea was a good one but all were leery of hiring a full-time events coordinator. When asked, Larson said his department could accomplish at least some of the events without a new organizer. However, Interim City Manager Al Viereck said holding an event a month at current staff levels would be next to impossible. “You’re going to tax his staff so badly that they’re going to leave him, even his part-time staff,” he stated. Viereck pointed out that Russell put a significant amount of time into organizing the 150th celebration in 2011, and he was able to tap into different city departments for assistance. Larson would not have the same ability, he stated. The success of the 2011 concert was a benchmark throughout the discussion. When it comes to other organizations needing assistance with events, Commissioner Charlie Gross said the Yankton Convention and Visitors Bureau (CVB) is available to help. Gross suggested that the lack of volunteers indicates the public does not really care about whether an event like the Fourth of July is held. A lack of volunteers does not indicate community disinterest, Commissioner David Knoff said. “The Fourth of July is a perfect example,” he stated. “If you don’t think it’s that important of a deal to the community because the Chamber doesn’t want to do it, then let’s quit doing it. Then (the public will) come in here, set us all on fire, shoot us and do everything else. They want the event. They just don’t want to step up to it. They want to go to it. Knoff said that, if an events coordinator were hired, the commission would have to do so with the knowledge they may have to be let go in a year or two if things don’t work out. “Todd, as long as you’re comfortable with that, I may be willing to take a risk on something like that,” he stated. Would A Retail Development Position Make More Sense? Guiding the discussion, Mayor Nancy Wenande asked if adding a retail development position instead of an events coordinator would make more sense. Several commissioners said having someone to promote retail growth in the community is a higher priority than an events coordinator. “It’s nice to think the developers will come to us, but Menards didn’t come to us,” Wenande said. “We went to the developer, and we pushed it. ‘We’ being Doug and the city. Someone had to make that connection. Someone had to go after it. They weren’t just going to come knocking on our doorstep. Commissioner Craig Sommer said a full-time individual could work on not only retail but pretty much anything non-industrial. The Yankton Office of Economic Development focuses on that sector. He said he was unaware of any contact with Greenbow Real Estate Partners, which is the developer for the Menards property, since city officials had visited with them during a retail convention earlier this year. The commission also debated whether it wanted to encourage Mike Dellinger in the Office of Economic Development to begin pursuing retail development in addition to industrial growth. Viereck reminded the commission that it will soon be interviewing for a new city manager. That employee could be charged with focusing on retail development, Viereck proposed. Larson added that, when he was an employee of Orange City, Iowa, an assistant city manager focused on both retail development and events planning. Larson said he reported to that individual, who was able to give him the citywide assistance he needed for events. Several on the commission said the idea of hiring an administrative assistant for the city manager who could take on these duties would be ideal. No one vocalized disapproval. The commission agreed to come back to the issue in the future once a new city manager has been hired. How did the people of Europe view greed in the Middle Ages? Well, they didn’t like it — at all. Surveys of the carnage of the American financial crisis that began in 2008 have revealed the potent allure of personal gain above all else. But greed hasn’t always been popular in Western societies. Stanford historian Laura Stokes is uncovering how attitudes toward “acceptable greed” have done a turnaround in the past 500 years. Self-serving behavior deemed necessary on Wall Street today might have been despised in medieval Europe. One might even have been murdered for using wealth as a justification for circumventing societal norms. While businessmen in the Middle Ages did amass personal fortunes, open greed was unacceptable to the community and could even lead to murder. Capitalism, Stokes has found, managed to flourish in the intensely community-conscious culture of medieval times. Men of business successfully built financial empires based on trade and credit, even though unbridled greed was universally condemned. The question that perplexes Stokes, an assistant professor of history, is how such men could be admired by their peers, when greed was frowned upon. It’s worth clicking on the link to read the rest of the story. Just to be clear, I’m not advocating for the murder of those who are openly greedy. Don’t try to pin that on me. But in an America where greed is often considered a virtue and the rich are elevated to saintly status, perhaps it would be worthwhile to remember what our ancestors knew — greed isn’t good for anybody. He recently did an interview with The Associated Press that is a good indicator for what you can find in the book. I think the above theme applies to Stiglitz’ work — to repeat, greed isn’t good for anybody. This interview with The Associated Press and some more background on Stiglitz can be found here. Q: The Occupy Wall Street demonstrations are no longer in the news, but you make the case that income inequality is more important than ever. How so? A: Because it’s getting worse. Look at the recent Federal Reserve numbers. Median wealth fell 40 percent from 2007 to 2010, bringing it back to where it was in the early ’90s. For two decades, all the increase in the country’s wealth, which was enormous, went to the people at the very top. It may have been a prosperous two decades. But it wasn’t like we all shared in this prosperity. Then came 2008 and 2009, and you saw these guys who brought the economy to the brink of ruin walking off with hundreds of millions of dollars. And you couldn’t justify that in terms of contribution to society. Mitt Romney has called concerns about inequality the “politics of envy.” Well, that’s wrong. Envy would be saying, “He’s doing so much better than me. I’m jealous.” This is: “Why is he getting so much money, and he brought us to the brink of ruin?” And those who worked hard are the ones ruined. It’s a question of fairness. Q: Markets aren’t meant to be fair. As long as we have markets, there are going to be winners and losers. What’s wrong with that? A: I’m not arguing for the elimination of inequality. But the extreme that we’ve reached is really bad. Particularly the way it’s created. We could have a more equal society and a more efficient, stable, higher-growing economy. That’s really the “so what.” Even if you don’t have any moral values and you just want to maximize GDP growth, this level of inequality is bad. It’s not just the unfairness. The point is that we’re paying a high price. The story we were told was that inequality was good for our economy. I’m telling a different story, that this level of inequality is bad for our economy. Q: You argue that it’s making our economy grow more slowly and connect it to “rent- seeking.” That’s an economist’s term. Can you explain it in layman’s terms? A: Some people get an income from working, and some people get an income just because they own a resource. Their income isn’t the result of effort. They’re getting a larger share of the pie instead of making the pie bigger. In fact, they’re making it smaller. Q: So, for example, I put a toll booth at a busy intersection and keep all the money for myself. A: That’s right. You just collect the money. You’re not adding anything. It’s often used when we talk about oil-rich countries. The oil is there, and everybody fights over the spoils. The result is that those societies tend to do very badly because they spend all their energy fighting over the pile of dollars rather than making the pile of dollars bigger. They’re trying to get a larger share of the rent. Q: Where do you see this in the U.S.? Can you point to some specific examples? A: You see it with oil and natural resources companies and their mineral leases and timber leases. Banks engaged in predatory lending. Visa and MasterCard just settled for $7 billion for anticompetitive behavior. They were charging merchants more money because they have monopoly power. A: The fundamental problem is not government debt. Over the past few years, the budget deficit has been caused by low growth. If we focus on growth, then we get growth, and our deficit will go down. If we just focus on the deficit, we’re not going to get anywhere. All the homeowners who are underwater, they can’t consume. We gave money to bail out the banking system, but we didn’t give money to the people who were underwater on their mortgages. They can’t spend. That’s what’s driving us down. It’s household spending. Q: And those with money to spend, you point out, spend less of every dollar. Those at the top of the income scale save nearly a quarter of their income. Those at the bottom spend every penny. Is that why tax cuts seem to have little effect on spending? A: Exactly. When you redistribute money from the bottom to the top, the economy gets weaker. And all this stuff about the top investing in the country is (nonsense). No, they don’t. They’re asking where they can get the highest returns, and they’re looking all over the globe. So they’re investing in China and Brazil and Latin America, emerging markets, not America. If the U.S. is a good place to invest, we’ll get money from all over the world. If we have an economy that’s not growing, we won’t get investment. That’s exactly what’s happening. The Federal Reserve stimulates the economy by buying bonds. Where’s the money go? Abroad. Q: What’s the answer, then? Raising taxes on wealthy people can’t possibly solve all the problems you mention. A: No, there’s no magic bullet. But there are other ways of doing things. Just to pick one, look at how we finance higher education. Right now, we have this predatory lending system by our banks with no relief from bankruptcy. In some fundamental ways, it’s really evil and oppressive. Parents that co-sign student loans now find out they can’t discharge those loans, even in bankruptcy. Education is so important, but there are so many barriers. Just 8 percent of those students in the most selective colleges come from the bottom half of the income scale. Eight percent! They can’t get in because they don’t get as good an education in elementary and high schools. Education is the vehicle for social mobility. It’s how we restore the American dream. I attended the Maha Music Festival in Omaha this past weekend. It’s the third time I’ve been lucky enough to be present for the annual event. This year’s line-up included headliners Garbage and Desaparecidos. But I was most excited to see Icky Blossoms, an Omaha electronic dance band that put out its debut album earlier this year. In fact, my brother and I were both in agreement that they were the band we were most looking forward to despite many other highlights in the line-up. We’ve been listening to their album non-stop. It turns out that our excitement was justified. When you start hearing Icky Blossoms music all over the place, remember you heard about them here first. They ignited an energy in the crowd at Maha that, quite frankly, no other band replicated. Dee Dee of the Dum Dum Girls at the 2012 Maha Music Festival. 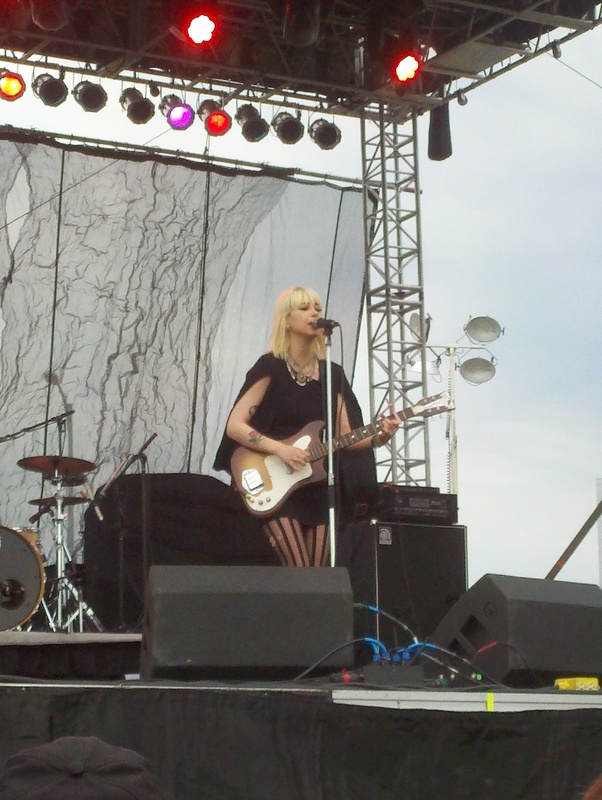 My second-favorite act of the day was The Dum Dum Girls. I’ve been listening to the band for the last three years. They do their gauzy dream pop very well, but they hadn’t risen to the top of my playlists. After seeing them live, I can tell you I’ll be listening to a lot more of them. They aren’t the most animated of bands live, but they are beautiful enough that a little swaying can go a long way. I didn’t record any footage of them Saturday, but this video pretty much replicates what I saw (down to the same outfits!). — Rain starting to fall just as Garbage closed their set with “Only Happy When It Rains.” Lead singer Shirley Manson called it a “precious moment” and claimed it had never happened before. — The sets of Eli Mardock and The Conduits, though I think The Conduits would have benefited from playing in the dark rather than 1 in the afternoon. For complete coverage of the Maha Music Festival, check out Kevin Coffey’s article for the Omaha World-Herald here and L. Kent Wolgamott’s story for the Lincoln Journal-Star here.